It’s hard to believe that our Tenten just turned 10. Our gorgeous girl shows no signs of slowing down…especially when she’s chowing down. There are just too many good things to eat. And if you’re a Mini Rex, like our beautiful show bunny – you love your food! For those of us who choose to eat organic for various reasons – I’m a firm believer that the same principles ring true for animals. Particularly for this tiny little bunny, who is only a fraction of our size, it matters more than ever. And just as grocery stores are full of food items devoid of any nutritional value, some pet foods are similarly packed with GMOs, food colouring and preservatives. That said, our velvet-bodied bundle of joy has been healthy, happy and full of attitude these many years. Albeit, this has included being entirely catered to, spoiled and beloved (we are her mere human servants after all). Thanks to companies like Oxbow for offering organic Meadow Hay and Pellets, which provide the bulk of her endless buffet. Plus, a carrot a day (mini carrots, of course) and a few other goodies round out her ongoing meals. It’s a life of continuous eating but if you’re a bunny, you’d have it no other way – something’s got to wear down those teeth! Some of Tenny’s favourite foods include banana (fresh and dried) – I know what you’re thinking: who would have thought that bunnies would love fruit? Believe me, just mention the B-word and they go bananas! They can hear you break the peel. Sometimes we have a hard time letting go. When our beloved dog, Shelby, passed away nine years ago we were devastated. We couldn’t bear the thought of getting rid of any of her stuff. What stuff, you ask? Dogs these days seem to have more things than some people. Pet parents know what I’m talking about: the designer bed, clothes, toys, and accessories. Some animals certainly live charmed lives. If only it was the case for everyone. It took a long time before we could even entertain the thought of getting another dog but if you’re a regular reader know we recently took the plunge and are now knee-deep in our life of puppy parenthood. Rather than go out and get a fancy, brand-new raincoat for our sweet Ivy, I rummaged through Shelby’s basket and pulled out her old raincoat. While it might be pouring buckets outside, we were still able to go out for a walk and keep relatively dry. Sure, it’s a bit big – but Ivy may grow into it yet. This old raincoat always made me smile. Despite the foul weather, adults and children alike would always stop and say hello whenever they saw Shelby wearing it. It was a little bit of sunshine on a dreary day. With Ivy, it’s no different – she somehow manages to charm all who meet her. We’ll see how long the raincoat lasts with this rambunctious one – whether she outgrows it or wears it to bits. Sometimes an old coat is better than a new one – especially one filled with warm, loving memories. If the raincoat fits, wear it. Wear it proudly. Even non-dog people know that a teething puppy needs to chew. Better to find something more appealing than your antique mahogany chairs or Italian leather loafers! So imagine how thrilled we were when our new puppy received this super-tough toy as a welcome gift from good friends and fellow dog owners. 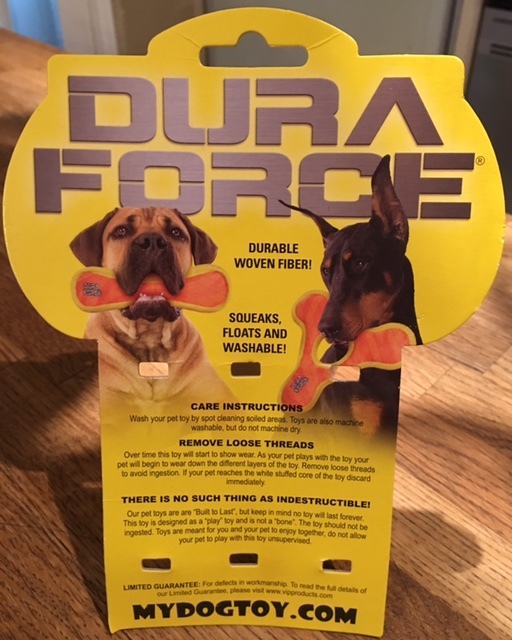 PET PARENT NOTES Ranked nine on DuraForce‘s Dura-Scale, this toy claims to be “extremely strong and durable,” which is essential for a busy girl with jaws of destruction. So far, we’re happy to report it shows little signs of wear even a month after lots of chewing. Although it claims to have a squeaker sewn in, it has remained silent from the beginning and has scarcely made a sound… Once summer is here, we’ll test the floating capacity in Ivy’s wading pool. IVY APPROVED As you can see in this classic “mine” pose when presented with this bone, Ivy claimed it right away. At night, it can often be found in her crate as she likes to keep it within paws reach. Handsome Lucian sends you our Easter greetings from the bunny world. It’s a rare year when Easter and Passover are celebrated on the same weekend. But it’s nice to think that as we usher in spring after a long, cold winter that families will be getting together and if they’re lucky – eating some good-quality, fair trade, organic dark chocolate! Where ever you find yourself this weekend, have a lovely holiday. Not only is it Friday but it’s National Puppy Day here in Canada – and what a great day it is to celebrate. As you may know, we recently added Ivy to our family and are so grateful to have found her. If dogs can be reincarnated, then surely she is our beloved Shelby returned to us eight years after her passing as a wonderful puppy! Although we’re all exhausted from tending to our new baby, we are amazed at how fast she is growing and learning each and every day. Any pet owner knows the joy and enrichment an animal can bring into a household. It’s been almost a week since we got her but our lives have already changed for the better. The Year of the Dog officially rolled in on February 16 and through an unexpected turn of events, we happened upon this blue-eyed beauty. Our family has always wanted a puppy but every attempt to find one in the past has somehow been thwarted. So, our attention was immediately captured when a friend told us that one of her colleagues had adorable puppies in need of good homes. When she sent a photo around for anyone interested, the striking father reminded me our dearly departed Shelby who will have been gone now for nine years this summer. Here are the proud parents – the father is a brindle Siberian husky and American bulldog cross, and the mother is a German Shepard and black Labrador cross. Last weekend while visiting Mont-Tremblant, Quebec, my husband happened to meet this sweet deer. If you’ve never been there before, the resort town is something of a cross between old Quebec city and Disneyworld – complete with live animals. In fact, the deer are about as prevalent there as raccoons are in Toronto. And they’re just about as bold, too, especially if they think you have something for them to eat. Be forewarned that you need to be extra cautious when driving – as they don’t always look both ways before crossing! Surprisingly, the deer seemed to have no fear of people and simply walked right up to my husband. It even allowed itself to be petted on the head – shockingly tame for a so-called wild animal! When the deer discovered there was no food to be had, it was a quick hello and goodbye. Then off it went into the woods from where it came. While I’m grateful there’s no hunting allowed in the area, I do worry about the health and safety of these lovely creatures interacting with all types of tourists. Take care, little deer. Late! Are you late? For a very important date? Running here, running there…yet never getting anywhere? Enough of that madness…it’s time to escape from the rabbit hole! As tempting as it may seem, now that Easter has passed, there’s no need to chase that bunny. While the cold of winter’s last gasps may have you wanting to curl up in your cave and continue the hibernation…spring is already here. You might not feel up to spring cleaning or power washing the terrace (particularly if it’s still covered in snow or ice) but it’s a great time to get organized. Start with one small task at a time: sort your seeds, plan your garden planters, check out some clips on proper pruning. And there’s always the paperwork…finish the taxes, shred some old files, clear out computer files (shed or basement, too). The time has come to leave the den behind, dust off the winter cobwebs and emerge face first in the sunshine.